Went outside for the first time and a lot of what I thought was rain earlier was sleet. We may have nearly an inch of sleet on top of the partially melted snow from earlier today. Still mixing Snow and sleet now, hoping as the heaviest returns move in in the coming hours it will flip all snow for a few hours at least. Awesome! Which mountain you on top of? I could be wrong but this precip shield looks like it will end earlier than suggested by models. Wind is howling at times here in SE Lumpkin. Still 37 and raining. Looking at the HRRR simulated radar, it is completely different than the WRF simulated radar. I am not sure which one to believe. I will say that there is convection in the Gulf that is causing a dry slot in SW Alabama and a big dry slot that has been modeled the entire time back in MS.
That said the WRF rotates the moisture through on the back side of the system and leaves the moisture hanging around which leads to the disco from the NWS about snow showers on Monday / Tuesday. The HRRR just evaporates that ball of moisture and clears everything out by Noon tomorrow. I will say I am getting some good wind gust here in Dacula. And now all snow. Let’s see if we can hold on to it. Warmed back up to 32.9 at the surface but I know the mid level temps are crashing right now. 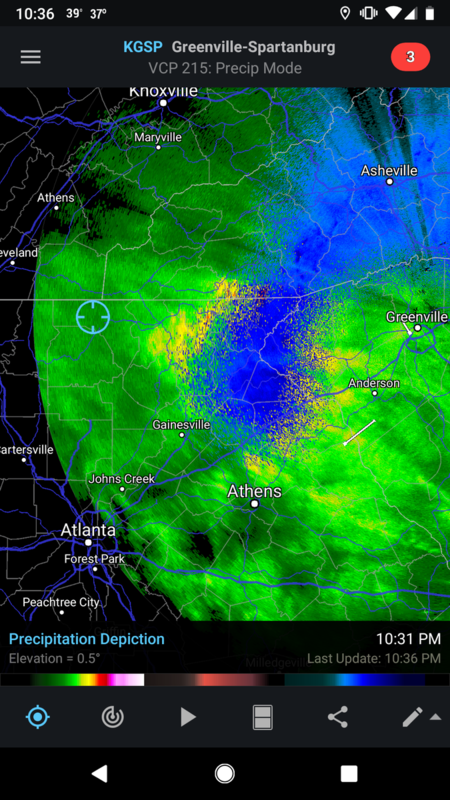 I have family just south of Demorest near Alto and it is dumping snow there. MAN! Wind is really howling now. Thought I had a tree hit the house and it was the hammock slamming into the back of the house. I should have already took that thing down. Forgot about it. Zero wind up here which is surprising the heck out of hearing from all of you and people over in SC. They must be getting some good snow or sleet in Clayton, the road temps just dropped again. 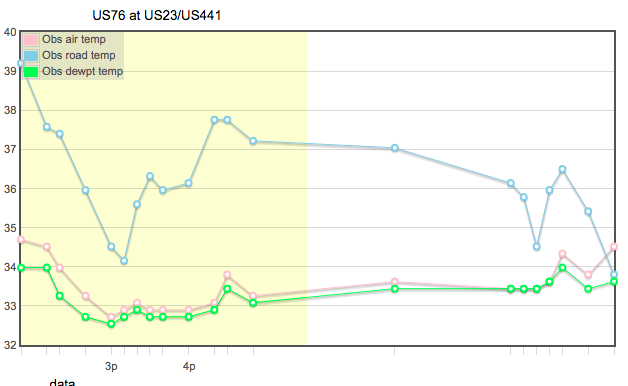 You can see the drop around 3p where it was snowing this afternoon. White county dispatch said snow is sticking to the back roads now. COME ON! I have zero wind, all rain and stuck at 38° for the past 4 hours. Blue Ridge, Fannin county. I'm starting to believe my only chance at snow is tomorrow night on the wrap around.